Simple elegance dazzles from the face of the Brasilia Lady. 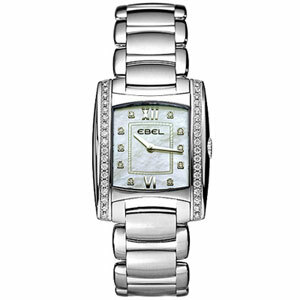 Magnificent Ebel Brasilia - Stainless Steel & Diamond women's luxury watch model # 9256M38/9810500 / 1215779. This beautiful Brasilia Women's Swiss timepiece features a Polished Stainless steel case and bracelet, 36 Dazzling diamonds set on the bezel, White Mother-of-Pearl Dial set with Silver tone hand indicators, 10 Diamond hour markers and Silver tone Roman Numeral markers, Double anti-reflective Scratch Resistant Sapphire Crystal, Swiss Quartz movement for unsurpassed precision, Water resistant to 50 meters / 165 feet. As all of our other watches, this Ebel Brasilia ladies watch comes with the original box, warranty card and papers!